Wireless Personal area network (WPAN) just refers to your home Wireless networks that you use in your everyday life to connect to the Internet to browse, download and stream data. A WPAN can also be used to create a file sharing environment between personal devices like two or more computers, laptops, tablet, smartphones and wireless storage devices. In a PAN a master device is called as a router but in the case of personal networks of devices for sharing files a device can act as master. WPAN works on short-range technologies like Bluetooth, ZigBee, Z-wave, Insteon, IrDA. The reach of WPAN can be a few meters only. WPAN examples are smart wears, home automation and wireless USB devices like printers, scanners, keyboard, mouse. Wireless Local Area Network can be ranged from a single flat to the whole building and mostly used to create home and campus networks. WLAN uses a wired cable and shares its connection to defined range by using wireless access points. Wireless routers act as a connector and access point at the same time, and another device can connect to access point to access the Internet. Our home wireless network, campus Wi-Fi are examples of WLAN. 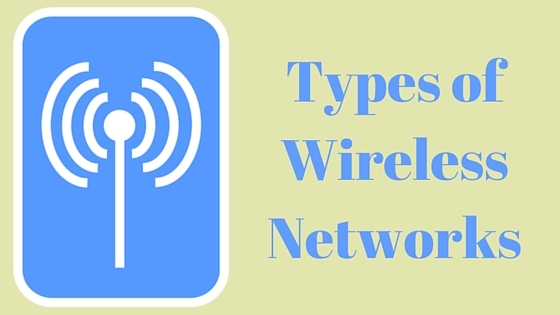 Wireless Metropolitan area network (WMAN) is a city-wide WLAN, it connects several WLAN and provides high range connection to its users. Type of WMAN is Wi-Max that offers a city-wide range for a wireless network to connect to the Internet. WMAN is used in creating point to point, point to multiple points and Mesh network and can cover up to a metro city. Professionals use WMAN systems, multi-wing organisations, but nowadays WLAN availability everywhere has made WMAN little unpopular. Wide area network (WAN) connects more towns and neighbour toward through wireless and are used as mobile phone signals. It is used to be connected when away from any network, Mobile signals can cover a larger scale and connect them to neighbour towers and this chain is called coverage of mobile networks.